We have lived in the country for 22 years now (30 acres in South East Indiana) but this is the first time I've ever tried raising chickens for my own eggs. But in these uncertain times it makes sense to start doing this as well as going back to gardening and 'putting by' the harvest which we stopped doing when the last child left home. The place where I'm constructing the coop is part of my barn. Years ago we had horses and a few goats that my oldest son was raising. 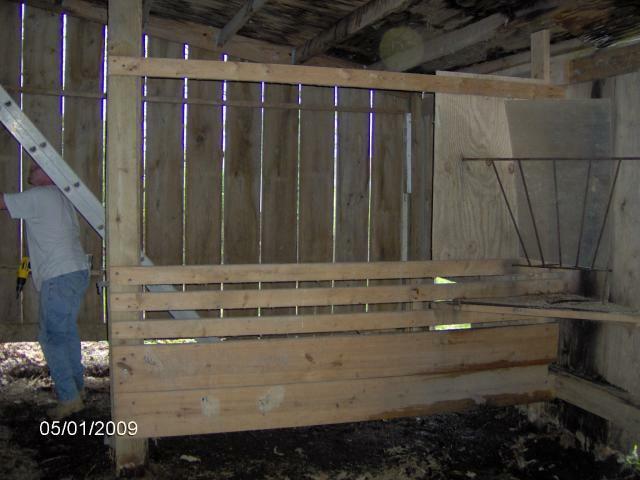 The goats and horses are long gone but the old goat pen still remains. 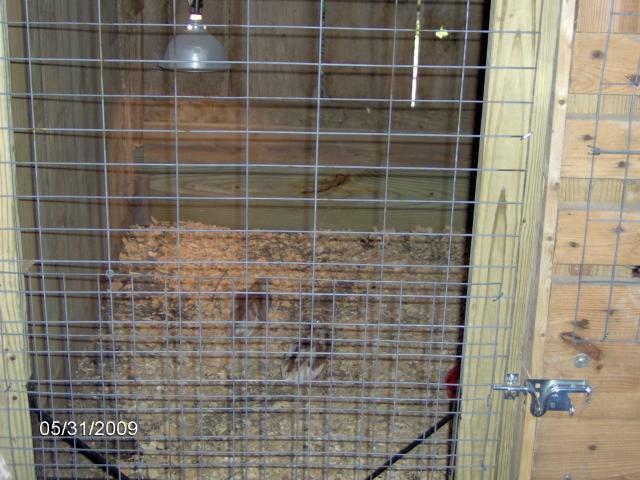 This will be the new coop. will become the roost area. 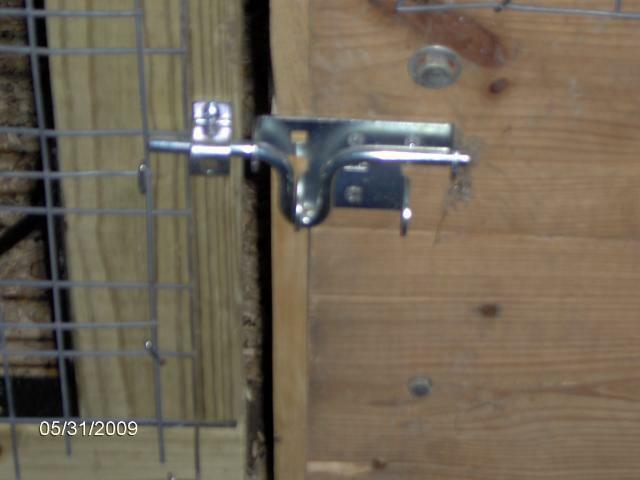 a sliding door will be installed with a rope and pulley to allow it to be raised and lowered (vertically) from outside the coop. outdoor run will be built in this area. The Coop is finished! Thanks to my son Eric who did 98% of the work, which included a new roof on part of the barn....We also decided that there needed to be more natural light inside so a window, that hadn't been planned, was added. You can also see the PVC feeder pipe on the outside of the wall. One 5 foot piece cut in 1/2 did the job. The door opens in and has two latches on it to foil any predators who might want a chicken dinner. Here is the pipe feeder idea that I picked up off BYC. 4" pipe with 2 1/2" holes drilled in it with a 90 degree bend. It didn't take long for the peepers to pick up on where the food was hidden. This is the roost. The next boxes will be installed into the wall on the right with access from outside the coop. You can see the outside access on the left which is temporarily boarded over until the wire run is completed. The 2x4's are horizontally placed. of any of them getting out. So, that's it until we get the outside fencing up and working in a couple days. At least they are out of the basement. Well, it's been more like 6 weeks but the outside coop is finally finished. My son (the builder) says he doesn't want to see any more wire for a couple months. I told him I could put something on the page and he might get a construction job, but he just looked at me and shook his head. 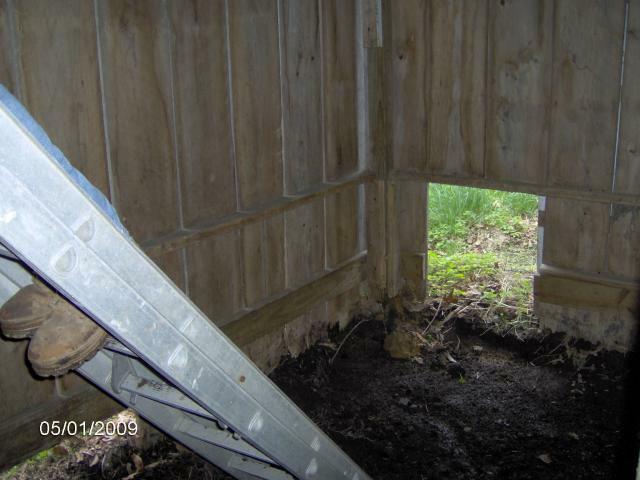 Here is the outside access from the barn to the outside run. It is made from two pieces of oak barn siding that was left over, and is pulled up from the outside of the coop via a rope and pulley. There is a ramp on the inside but they don't seem to need it but I'll leave it there. 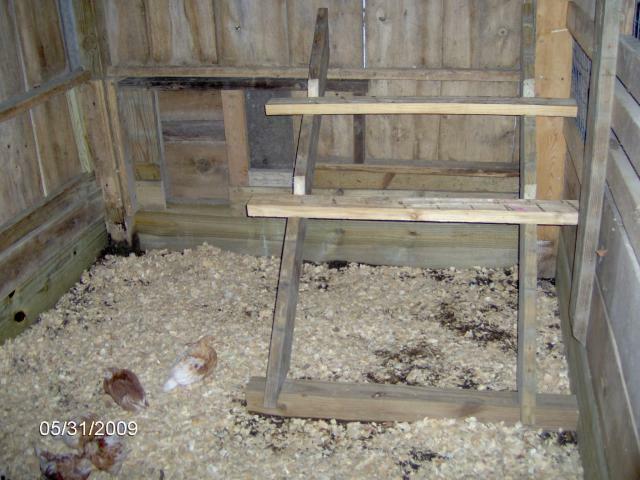 This is a view of the coop. It is about 15 x 15 and the roost is a piece of old log that has it's own complement of bugs living inside. This was taken today, the first time they have been outside in the coop. 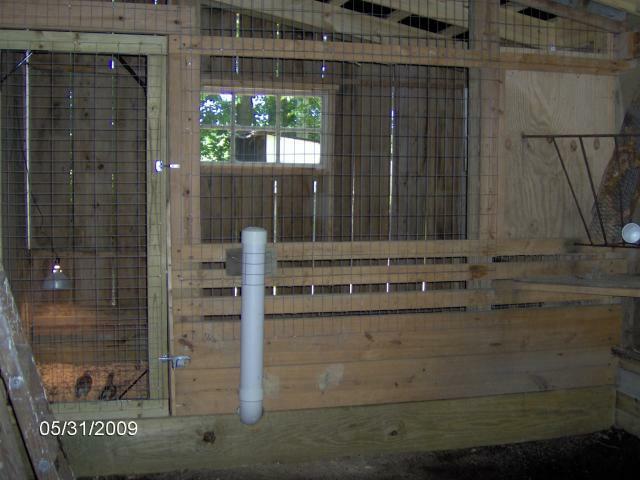 The coop is covered with chicken wire just in case there are any chicken hawks hanging around the area. The main fencing is welded wire, stapled to the beams. There is a gate on the right side for access. And that's about it. The only thing left to build are the nest boxes and there isn't any rush on those since it will be another month and a half probably until they get to the laying stage. Thanks for visiting "Hershey's Coop" and I hope this has helped you with construction questions, or, just getting you going with your own coop. 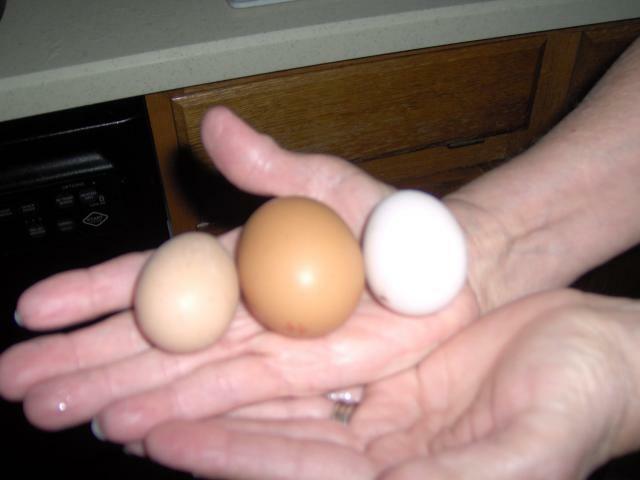 8/7/09 The one in the center is store bought large size. 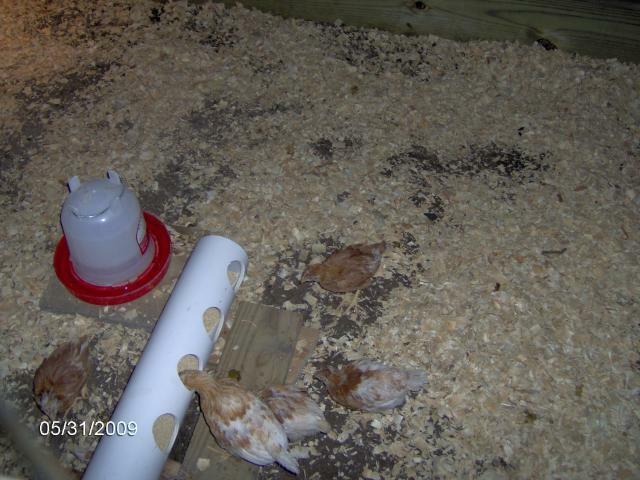 Near as I can figure, the hens are 16 weeks old. Our FIRST eggs!!! 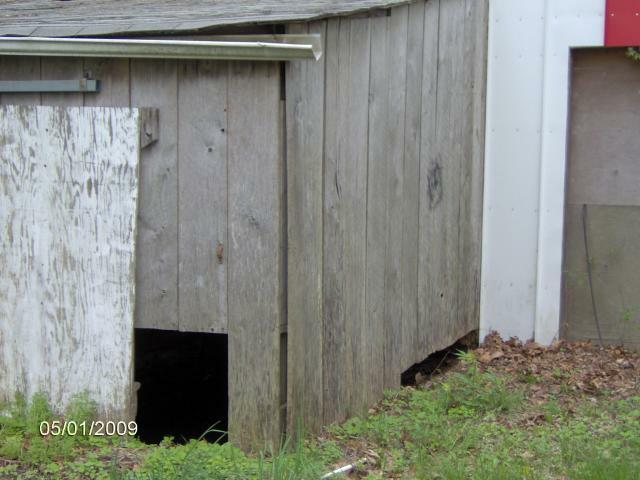 I like the idea of setting up a coop using an existing barn. 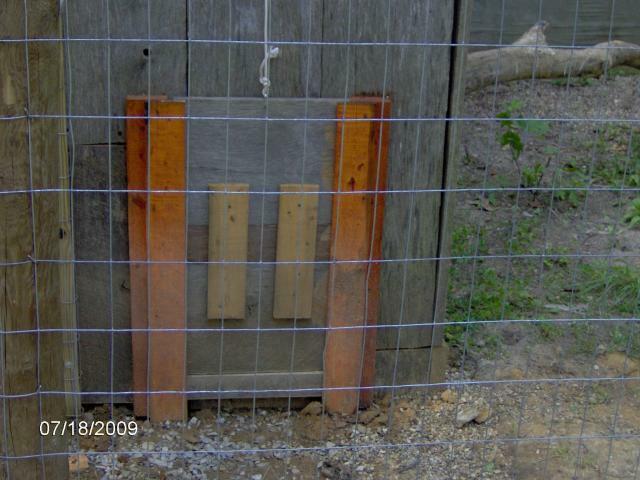 You may want to look at all access points to the barn to see if predators have other ways to access your chickens. 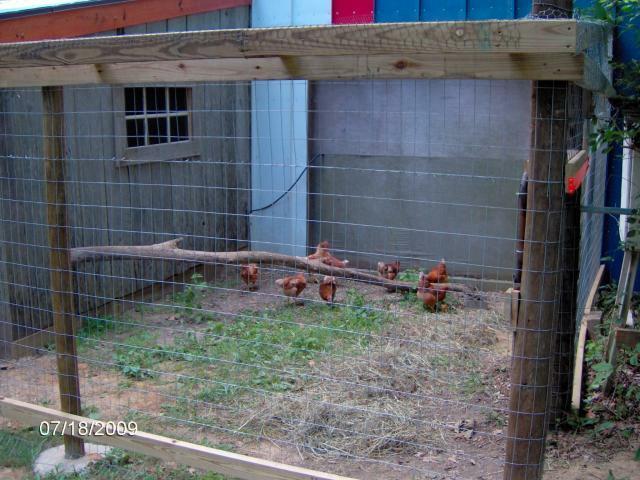 Every time I look at my coop and run, I try to think of ways predators could get in. I drive my husband a little crazy with it but for all the time, effort, and money we have in our chickens; I want to be sure predators aren’t picking them off. I love seeing big roomy coops. You can NEVER have too much space for chickens!! But for protection for your babies, I would add a apron around the edge so nothing can dig in. And also use Hard Wire Cloth for it and the windows.